UTIs are extremely common, but if not treated promptly, they can spread and cause a serious kidney infection. If you have – or suspect that you have – a urinary tract infection, schedule an appointment with a healthcare professional as soon as possible. Urinary tract infections can affect the lower or the upper urinary tract. Lower-tract UTIs refer to infections of the bladder or urethra. Upper-tract UTIs refer to infections of the ureters or kidneys. Upper tract UTIs are more rare and usually more severe. Although occurring less often than in adults, children can develop urinary tract infections as well. Infants born with urinary tract abnormalities have an increased risk of UTIs. The symptoms of a urinary tract infection usually depend on which part of the urinary system is infected. Lower-tract UTIs typically manifest in the strong, frequent urge to urinate, cloudy or bloody urine, a burning sensation when urinating, and bright red or pink-colored urine. Common symptoms of upper-tract UTIs include pain in the lower back, nausea, fever, chills, and vomiting. A urinary tract infection in men may also cause rectal pain. In women, lower tract UTIs can lead to pelvic pain. In children, symptoms of UTIs are easily overlooked. Parents are advised to to be aware of any signs of irritability, frequent and/or painful urination, strong odor to the urine, pain around the belly button, and unusual day or night wetting. If infants experience a burning sensation or pain, they may cry when urinating. If the UTI has spread to the kidneys, the child may also have high fever and back pain. 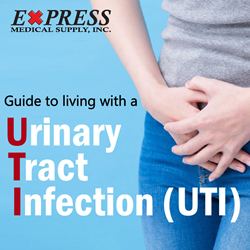 UTIs are typically caused by bacteria that has enter the body through the urethra. Although anyone can develop a UTI, women are at a greater risk. Most urinary tract infections affect the lower urinary tract (bladder and urethra).